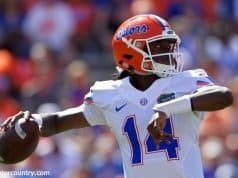 The Florida Gators finally broke the curse of late game collapses on Saturday as they pulled out a victory over an equally struggling Georgia Bulldogs team in Athens. The Gators came into the game looking for any kind of answers they could find. It started with a fresh lineup that featured all three freshmen for the first time this season. Neither team made a shot for over two minutes to open the game, but after Andrew Nembhard found Kevarrius Hayes for a basket, KeVaughn Allen followed it up with five straight points of his own to put Florida up 8-0. Meanwhile, Georgia missed its first three shots from the field before finally getting one to fall at the 14:20 mark. 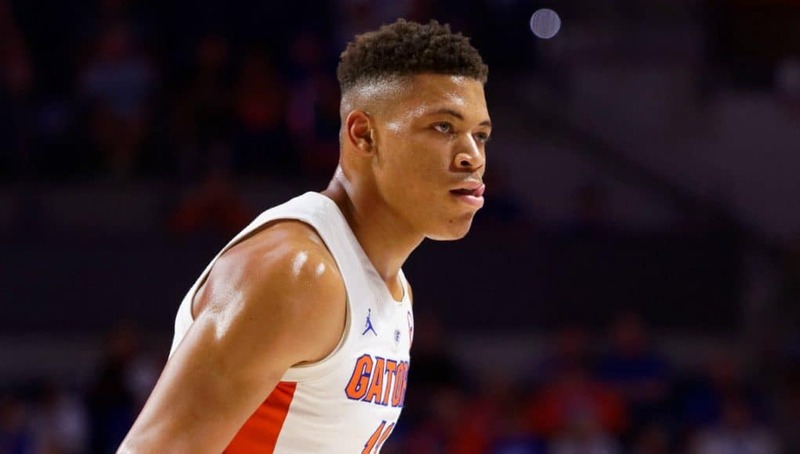 A pair of three-pointers from Jalen Hudson and Nembhard gave the Gators an 11-point lead, and with the way the Bulldogs were shooting it and taking poor care of the basketball, it felt like a game that could quickly turn lopsided in Florida’s favor. A 7-0 Georgia run cut the lead to just four points, but freshmen Keyontae Johnson and Noah Locke had something to say about that with back-to-back scores that made it 21-12. The Gators stretched that advantage to as many as 13 before ultimately going to the locker room up 33-23. Along with the 12 points off turnovers, Florida also benefited from strong three-point shooting in the first half. The Gators made 5 of their first 7 shots from deep and ended up shooting 53.8 percent (7-for-13) from there in the first 20 minutes. The only way the Bulldogs were able to keep it remotely close was by getting to the foul line and making 10 of 12 free throws. The second half ended with the same result as the first, but told a much different tale. Georgia made a couple of quick layups to start the half. Then, it became the team that couldn’t miss from beyond the arc. The first three made it a 33-30 game less than two minutes into action. Deaundrae Ballard answered with a three-ball to end the run, but Georgia knocked down three straight triples to bring it all the way back to a tie game at 40-40. A couple minutes later, the Bulldogs took their very first lead of the game. The sellout crowd roared, and Florida looked to be on the verge of letting another one slip away. Johnson hushed the crowd briefly with an impressive three-point play to regain the lead, but it was short-lived as Georgia scored six straight to go up 48-43 with 9:38 remaining. 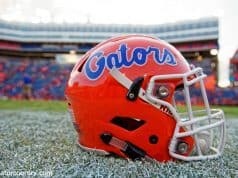 That was the defining moment for the Gators. They could either crumble and be victims to the same fate as the first four SEC contests or put the mental block late in games to bed. A tipin by Hayes and a layup by Nembhard cut the deficit to one point, and despite having a relatively quiet night, Locke capitalized with a three-pointer a couple possessions later that would give Florida its final lead. That was the start of 12 straight points by the Gators, capped off by a three from Allen to make it 55-48 with 3:36 on the clock. A couple Georgia free throws by Nicolas Claxton brought it within five, but Allen came up big again with a left-handed runner at the 2:28 mark. Continued strong defense from there made it smooth sailing for Florida the rest of the way as it closed out a 62-52 win. The Bulldogs made just one shot from the field in the final nine and a half minutes as the Gators finished the game on a 19-4 run. Allen finished as the game’s leading scorer with 13 points, followed by 10 points from Locke. Johnson and Hayes got it done on both ends as the freshman had 8 points, 7 rebounds and 2 blocks while the senior had 7 points, 9 rebounds (6 offensive) and a block. In his first career start, Johnson also led the team with 32 minutes on the court. While there is a lot of positive to take from the win, a player who looked to be headed toward his best game of the season had his day cut short. Keith Stone hadn’t made a single field goal in SEC play before Saturday, but he had 8 points in the first half, including a monster dunk, and was finally playing with some confidence. Then, he went down with a knee injury early in the second half after going up to attempt a block. He laid on the floor in pain for several minutes before being helped to the locker room. After a week on the road, the Gators will return home for a midweek matchup with Texas A&M before heading to TCU for the SEC/Big 12 Challenge. 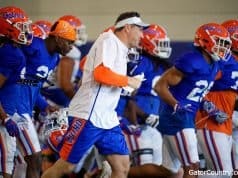 If Florida can turn this momentum into a couple more wins, the horrid start to conference play will be in the rearview.